Assuming you buy a good-quality solar system of a suitable size (which, after reading this book, you’ll know how to do), how much energy your system delivers will depend on your roof. Specifically, its size, direction, angle and shading. Unless you own large swathes of land and want to ‘ground mount’ your system, the size and shape of your roof will determine how many solar panels can be installed on your home. The largest system (in kW) you can fit on your roof. What percentage of panels will point in which direction. Do that now. Go to your computer, tablet or phone and fire up my panel-fitting tool. Watch the tutorial and then smother your roof with solar panels to discover the upper limit of what’s possible for your home. Depending on your roof’s design, you may have a choice of roof directions or be forced to use certain roof faces. At least, thanks to the tool above, you know your options. Let’s see how roof direction affects your system performance and payback. In Australia, the sun rises in the east, moves across the north and sets in the west. North-facing roofs will capture the most sun, giving you the most solar energy over any 12-month period. Given the choice, most installers will recommend north-facing panels. But, increasingly, people are putting some or all of their panels on east- and west-facing roofs too. A panel facing east or west will produce about 12% less power than if it faced north – so what’s their logic? Figure 1.11 The path of the sun in Australia. 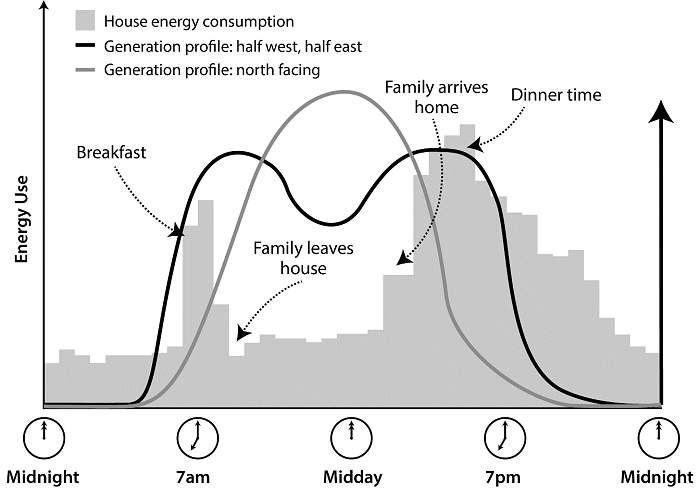 Figure 1.12 A typical home’s energy consumption profile over a working day, compared to solar electricity generation from both a north-facing system and an east/west split system. They do it because solar panels that face east or west will shift some electricity generation from midday to the start or end of the day. Most homes use more electricity early and later in the day, as the family wakes up and after the family gets home from school or work. For a majority of Aussie homes, having solar panels facing east and west will make their electricity production more in sync with their usage habits. This means the householders will consume more of their solar electricity in their home and export less to the grid. Which panel direction will maximise self-consumption for you? The best panel direction to maximise self-consumption of solar electricity will depend on your household’s consumption patterns. Panel directions and the type of households they usually best suit are set out below. North: Panels that face north will produce the most electricity overall. 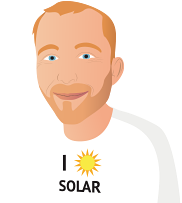 North-facing solar panels are often the best choice for people who are at home during the day. This is not only because they are there to use the electricity when it is produced but also because it is easy for them to shift demand by using washing machines, clothes dryers, pool filters and other devices in the middle of the day. Because north-facing panels produce the most electricity overall, they have the greatest environmental benefit. And if feed-in tariffs rise (which they will if wholesale electricity prices rise), north-facing panels will make even more sense. West: Panels facing west produce around 12% less electricity overall than north-facing panels. They also produce less electricity in the morning but more in the afternoon. They reach their maximum output around 1:30 pm, and just before sunset they will produce around one-quarter of their peak maximum. West can be a good direction for people with high demand for air conditioning in summer. It’s also an excellent direction for people who are usually out of the house by the time the sun comes up but return in the afternoon. However, because of the reduction in the total amount of electricity generated compared with north-facing panels, the increase in self-consumption that will result will need to be considerable to make west-facing solar panels worthwhile. North-west: Panels that face north-west will produce around 5% less electricity overall than north-facing panels. Their electricity production through the day will be between that of north-facing panels and that of west-facing panels. They produce slightly more electricity during the afternoon and slightly less in the morning. East: Solar panels that face east are similar to west-facing panels, producing around 12% less electricity overall than north-facing ones, but they will produce more electricity in the morning and less in the afternoon. People who are out of the house in the afternoon can benefit from them, as can households with high consumption in the morning. North-east: Solar panels facing north-east will produce around 5% less electricity than north-facing panels. Their production throughout the day will be between that of north-facing panels and that of east-facing ones. East and west: Placing some panels facing east and some facing west will result in the total amount of electricity produced being around 12% less than if all the panels were facing north. This arrangement is often called an ‘east/west split’ and has the advantage of producing a more constant output of electricity during the day (see the previous figure), which can help to increase self-consumption. The steeper the roof, the smoother the output of the system will be. 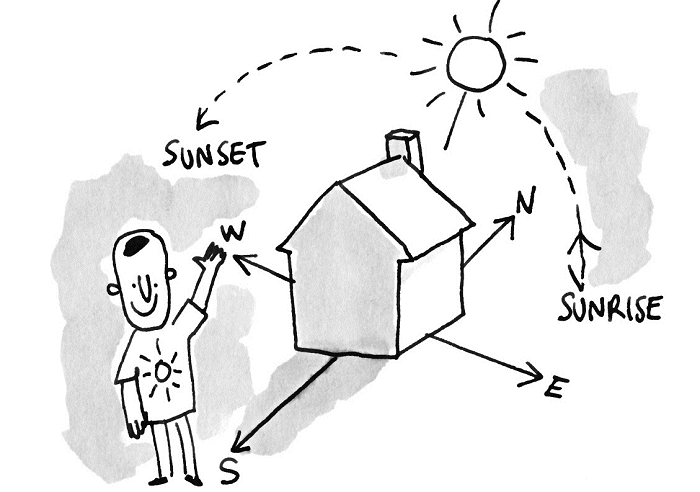 An east/west split can normally have a different number of solar panels facing in each direction. If a household uses more electricity in the afternoon, more panels can be placed facing west. It can suit people who are at home all day as well as those who are at home in the morning or in the afternoon. South: For most Australians, south is the worst direction panels can face. Some people consider installing panels facing south almost as large a mistake as installing them upside down. In Sydney, south-facing solar panels will produce around 28% less energy than north-facing panels. In the far north, the difference is not so great. In Townsville, south-facing panels will only produce around 17% less electricity in total than north-facing ones. In summer, they will also produce more electricity than north-facing ones. Because people in Townsville usually use considerably more electricity in summer than in winter to run their air conditioners, south-facing panels can improve self-consumption there. In Darwin, south-facing panels only produce about 15% less electricity overall than north-facing panels. Because the Northern Territory still has a high feed-in tariff, though, the most cost-effective direction to face the solar panels is north. Combining directions: Panels can be placed in multiple directions, not just an east/west split. For example, some panels could be placed facing north and some facing west. This will result in an output similar to all panels facing north-west. It’s even possible to have panels facing in more than two directions. Online resource: Power loss table: solarquotes.com.au/powertable This table shows you how much energy you can expect to get from almost any roof direction. Bear in mind that a good installer will do all these calculations for you. They’ll even project which roof directions will give you the best payback based on the compromise between energy yield and maximising self-consumption.